Ribbon of Road is in this month´s National Geographic Adventure Magazine. Help support people who support us by checking out their Web site or picking up the December issue. Birthday wishes become really simple when camped in the middle of the Atacama desert after cycling across Bolivia, the second poorest country in the Western hemisphere. This year, mine was for a nice sunset to help me forget about all of the sand in my eyes and teeth. 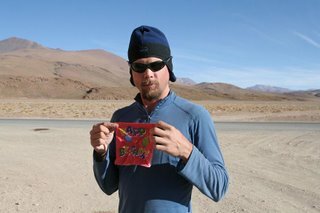 We`ve arrived in San Pedro de Atacama, Chile after twelve miserably amazing days of riding through the Bolivian desert. We`ve officially left the land of ¨no hay, no cambio y mas tarde¨ and entered Chile, a country that seems to have most everything a hungry cyclist would want. The last twelve days tested our spirit, bodies and bikes to a level we´ve never experienced before. The riding conditions were some of the worst we`ve ever encountered. The ¨road¨, when there was one, was a semi-consistent mix of deep sand, loose gravel, huge rocks and skull jarring washboard. Each day, we rode about eight hours and struggled to make it more than 35 miles. We rode through some of the most beautiful and bizarre landscapes that we`ve seen from two wheels. On the Salar Uyuni (the world`s largest salt lake), we rode for three days to a horizon full of nothing but whiteness with sunsets that made you feel like you were on a different planet. Through the desert, we passed red, green and white colored lakes full of pink flamingos. For three days, we didn`t see one car. 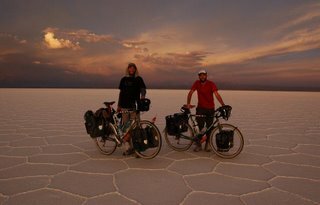 We pushed our bikes, crashed and spun out in the deep sand daily and froze our arses off each night. We rode into a 30mph headwind up and over a 16,200ft. pass before reaching the sweet, sweet asphault of Chile. Now, at 7000 feet (our first time below 11,000ft. in two months), the oxygen is thick, the air is warm and the beer is cold. In Stage 3, Part 4 we rode through the some of the most important and most incredible Incan ruins and traded in the mountians for the high, flat altiplano. We passed the tranquil shores of Lake Titicaca, entered Bolivia and rode into the world`s highest capital. Pictures from this stage are online in the Gallery section of this Web site. After taking some time in Cuzco to relax and enjoy one of the America`s finest cities, our recently developed gang of seven touring cyclist began to dwindle away as quickly as it had formed. Don Thomas powered ahead to prepare himself for the arrival of three of his delinquent amigos from the states. David, Crystal & Jamon searched high and low for the absolute cheapest possible route to Machu Picchu and commited to a lengthy strand of buses, taxis and hiking. Wouter fell victim to his Peruvian love once again and returned to Huarez, via a brief 50 hour bus ride. We decided to ride our bikes through the Inca`s Sacred Valley to get us as close possible to Machu Picchu before having to jump on a train for the final leg. Bidding farewell to our buddies, we made one last ceremonial ride by Cuzco`s famed ¨12 sided stone¨ and admired the fine construction of one of the city`s last great Incan walls. Climbing out of the city, Brooks forgot about the difficulties of riding at elevation as Gregg complained steadily about the recent rib injury that he incurred while attempting to crack the frenchman´s back. A sweeping downhill dropped us into the lush, green Sacred Valley and into the town of Pisac just as it`s famed Sunday market was in full swing. Sampling a bit of everything, including the valley`s giant corn, we circled the market until it began to break down as darkness fell. The following morning, we hiked the ruins of Pisac which clung to the mountains right above town. The ruins seemed to stretch from the highest peak almost all the way back into town through perfectly terraced hills. Next stop in the valley was the town of Ollantaytambo which had another amazing set of Inca ruins shooting straight up from the edge of the village. The highlight of the town, however, was it`s narrow labyrinth of cobble stone streets that sheltered you from a plaza full of tour buses. It was here, that we procurred some expensive train tickets to take us to Aguas Calientes and the much anticipated Machu Picchu. Before boarding our train, we bumped into David, Crystal & Jamon who had just returned from the ruins and gave us the inside scope of the best way to see Machu Picchu and where to secure our tickets to ensure an early AM entry to the grounds. At 4am, we left our hotel in Aguas Calientes for the steep hike up to Machu Picchu. Lucky for us, our cycling legs provided for some serious passing power as we blew by everybody on the trail ahead of us and were first in line as the gates opened at 6am. Arriving at the ruins, our moring efforts seemed worthless and Brooks felt like he was back in San Francisco as a blanket of fog covered the whole area. However, moments later (to the sound of a distant andean flute) the fog lifted ever so delicately as the sun rose, mysteriously revealing the ruins of Machu Picchu. It was a truly incredible sight. Shortly thereafter, we scampered across the grounds to climb up Wayna Picchu, the huge mountain that sits just behind Machu Picchu. After another climb that seemed to go straight up, we found a high perch for a lunch break and enjoyed the ruins from a different and unique perspective. Not often does such a high profile place live up to the hype, but Machu Picchu is definately a magical place, exceeding all expectations. Get there before the tour buses do and you will be rewarded! Riding a high out of the Sacred Valley, we returned to Cuzco and reunited with Jamon who would be the only one to continue south towards Bolivia with us. Out of Cuzco, we rode south along a river and began our steady climb towards the altiplano. In the town of Urcos, we loaded up on coca leaves at the local market to ensure we had enough to produce tea for us until we left the high plain. Just before La Raya (the pass marking the beginning of the Peruvian Altiplano) we found a picturesque set of hot springs that nearly ended our day of riding. After three hours of soaking beneath some snow-capped peaks, it was a tough pill to swallow to get back on the bikes and start our climb over again. Over the pass, storm clouds seemed to linger all day long and our riding was often interrupted by huge bolts of lightning striking nearby fields, followed by tremendous thunder that could almost knock you off the bike. We thought the locals to be very enthusiastic of our riding, sitting in front of their houses waving frantically at us, until we realized that they were just trying to save us from getting struck by lightning. There wasn`t too much to the towns leading to Puno and Lake Titicaca except for the craftmanship of the local rickshaws and moto-taxis. They reminded us of the chicken buses of Guatemala in both decor and bling. Each owner was more than proud to show off his prized possesion by giving us a ride around the plaza, gawking of his ride`s comfort. Arriving in Puno meant a day of rest and a visit to Uros, Lake Titicaca`s floating islands. The islands, made of reed, were surprisingly comfortable with about ten families living on each one. The women hawked goods to arriving tourists as the men were off fishing. They were a rather unique experience and proved to be very photogenic, however, they definately fell under the category of ¨seen one, seen them all¨. South of the contaminated bay of Puno, Lake Titicaca came alive and it was immediately apparent why this lake (the highest navigatable lake in the world) was the birthplace of the Incas. Just before the Bolivian border, we stayed in the town of Julì and bumped into our boat captain from two days before who recommended a hospedeja for us to stay at. We also stumbled across an old cathedral which just so happens was the local kid`s number one kite-flying spot due to it`s high wind and lack of power lines. We sat back and watched all the kids fly their home-made kites high above the town. Something so simple kept so many kids so captivated. It provided for a perfect spot to sit back and reflect. Crossing into Bolivia, the border was surprisingly tranquillo, missing the hustle and bustle of the average border crossing. We arrived in Copacabana, a small laid-back town on the shore of lake Titicaca full of vagrantes from around the world schleping hand-made jewlery. Bolivia seemed fairly similar to Peru with the exception of the people keeping more to themselves and lacking the overall curiosity for three gringos arriving on bikes. We visited the Isla del Sol, the true birthplace of the Incas, and hiked the island for a full day with 360 degree views of the lake. Leaving Copacabana, was one of our more memorable days of this stage. We climbed a 14,000ft. pass out of town and rode the ridgeline of a penisula, surrounded on both sides by the sparkling blue water of Lake Titicaca. As we continued towards La Paz, we rounded a corner and the horizon filled with the snow-capped peaks of Bolivia´s Cordillera Real. We rode alongside the massive 20,000ft. peaks and finished our day in the small village of Huarani at one of the most spetacular sunsets of all time. We rolled through El Alto (Latin America´s fastest growing city) which congests the ridgeline above the world`s highest capital. La Paz sits in a huge bowl surrounded by mountains with houses littered all the up it`s steep banks to the rim. We dropped 1500ft. down to the city`s Plaza Murillo and quickly found an ice cream slinger to put out of business for the night. Shortly thereafter, we found the french restaurant (Le Comidie) that Jamon had been raving about since Cuzco and had an amazing meal chased with a few bottles of the finest french wine. Next up, we head further south towards Bolivia`s barren southwest corner. We`ll cross the Salar Uyuni (the world`s largest salt lake) before plowing through a desolate section of the Bolivian desert to San Pedro de Atacama, Chile.